There are some weeks where coming up with menu items is so exhausting. This is one of those weeks. I'm tired of buying food and I'm tired of spending the time cooking and cleaning up. I told my husband that I wish we could just eat Mexican food all week. Quesadillas, tacos, fajitas, burrito bowls. How easy does that sound? So, that's what we're doing. 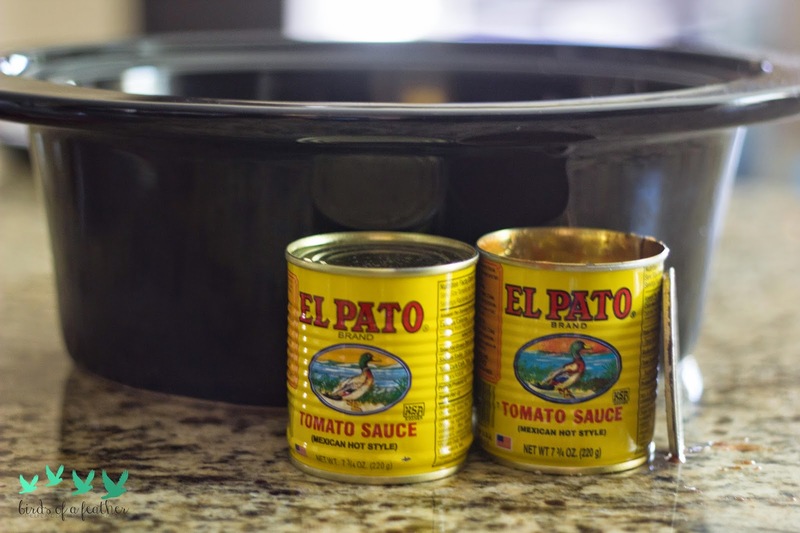 I have a big Sams pack of chicken in the slow cooker with one of my all time favorite flavors: El Pato. 1. Clean the chicken and put in the slow cooker. 2. Pour El Pato over chicken. 3. Cook for 4-6 hours or until chicken shreds. We are pairing this chicken with peach salsa, chipotle salsa, regular salsa, homemade guacamole, sour cream, cheese, fajita peppers, tortillas, brown rice and black beans. It's amazing how many different combinations you can make with those ingredients. We make our Mexican light and healthy by using fresh ingredients and whole wheat, spelt or sprouted tortillas. You can leave off the sour cream and cheese...if absolutely necessary. Like if it's a life or death situation. Or use what some call "portion control". I'll be posting the recipes for my salsas later this week. You'll want to pin those. Trust me. So give yourself a break and enjoy some delicious and good for you Slow Cooker Mexican Chicken.